Hoverboards are so much fun to ride. These self-balancing scooters give you the feeling of gliding on air although, technically, they are still pretty much in contact with the ground through their tires. Over the years, man has continued to experiment with true hoverboards that literally levitate above ground. And while we have yet to see a production type of this kind, it would be best to do something about standard hoverboards’ balancing issues. While these scooters have sensors that effectively balance the rider standing on the platform, wipeouts are a common occurrence especially among newbies. That’s why innovators have come up with an accessory or an attachment that can literally transform an ordinary hoverboard into an ultra-futuristic Go-kart or mini-kart. These accessories have greatly improved the stability of hoverboards, significantly increasing the levels of enjoyment of anyone sitting behind the three wheel version of the hoverboard. In this article, we’re sharing with you the best hoverboard cart for sale that you really have to consider attaching to your own self-balancing scooter. One of the most unique and perhaps the best hoverboard cart is the HoverSeat. It is characterized by a full rectangular frame that can accommodate any of your favorite beach chair. This allows superb versatility and optimum comfort. It should be understood that the HoverSeat doesn’t include the chair so you’d have to bring in your most comfortable lounger if you wish. This makes for great customization and superb comfort sitting. The HoverSeat clamp only works with hoverboards that are sized 6 and 10 inches and with rounded middle sections. Instead of the usual single caster-type wheel, the HoverSeat comes with two large tires to provide for a more stable 4-wheel hoverboard go-kart. If it’s a mini kart that you’re really after and one that you can take anywhere, the HoverSeat is an excellent choice. If you have a child who happens to love his or her hoverboard but you are worried about wipeouts, then the Cool Mini is the one to get. This hover Go-kart attachment boasts of a fully extendable frame complete with PU caster wheels with performance ball bearings for smoother ride. The 3 wheel arrangement helps ensure stability while the easy-grip handle bars allow for excellent maneuverability. The good news is that the Cool Mini is also great for adults as the frame can be easily adjusted. The seat comes with superb molding that affords it amazing lumbar support even for grown-ups. And with a price-beat advantage, the Cool Mini is a great mini kart conversion kit to attach to any of the major hoverboard brands like Razor, Swagway, Glyro, and Powerboard just to name a few. The WorryFree features one of the largest front wheels among the 3 wheel hoverboard mini kart conversion kits. This significantly improves the overall stability and turning abilities of the WorryFree. Additionally, the frame is made of high grade lightweight aluminum giving it superb durability. The WorryFree’s sport seat design gently wraps around the lower back of the rider to give ample support while also keeping the rider firmly glued to the seat. Like the Cool Mini, the WorryFree can accommodate a variety of major brands of hoverboards giving it superb versatility. As long as your board is sized 6.5 inches, 8 inches, or even 10 inches, you can expect the WorryFree to give you a worry-free, more stable, and more enjoyable ride. It may be a bit pricey but the Primo is considered to be the best hoverboard cart for sale. Made of premium quality carbon steel complete with wear-proof bearings, there’s no comparing the Primo over other types of conversion kits. The aluminium clamps make for very easy adjustments in the length of the Primo to accommodate any age and size of rider. The sport seat is beautifully molded with a higher backrest and a deeper shell for optimum lumbar support. It comes with a limiting angle which is particularly beneficial in reducing the risk of falling backwards. The handle bars come fully padded for optimum grip while its balance reset feature keeps the Primo mini kart level especially when your hoverboard is either in a shutdown or startup mode. 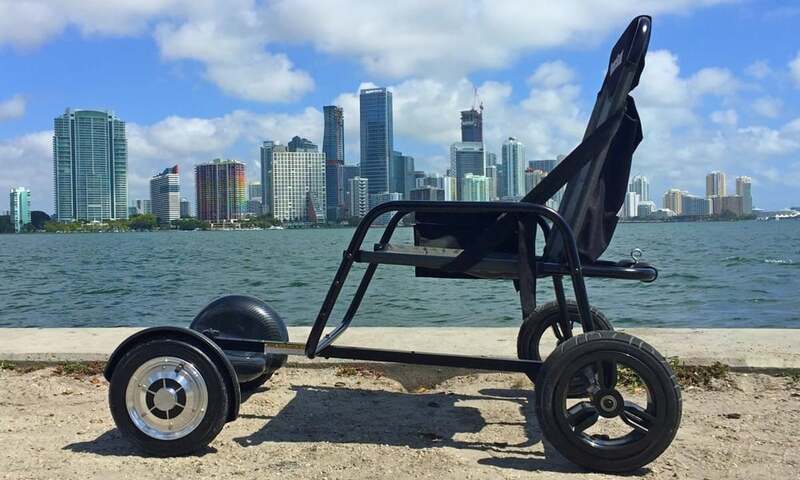 Many believe the HoovyKart is the best hoverboard cart for sale today. It boasts of fully rotating, full padded handle bars that allow for superb maneuverability and control of acceleration, turning, and braking. Sitting on the hoverseat is super comfy as the lumbar section of the seat is fully adjustable to account for the height of the rider. The foot pedals and the retractable skeleton can be easily adjusted to accommodate any size of rider. The aluminum frame provides a lightweight yet ultra-strong platform that can support up to 250 pounds. The best hoverboard cart should not really be very difficult to choose especially if you have a general idea of the things that you need to look for. Your decision to build a hoovykart or hoverboard mini kart underscores the fact that you already have a hoverboard to begin with. Otherwise, you’d have to get hold of a self-balancing scooter first before you can even begin looking at ways to improve your overall hoverboard riding experience. Framework – One of the things that you really need to check in choosing the best hoverboard cart for sale is the sturdiness and rigidity of the framework. Some come with a fully retractable skeleton to allow for portability. This goes hand in hand with the hoverboard Go-kart’s ease of installation. The frame of the Go-kart accessory attaches to the hoverboard complete with a seat and handle bars that provide steering controls. A third small wheel is located in front of the mini-kart attachment to provide stability in a three wheel formation. Ease of installation – As much as possible, it is imperative to choose one that can be easily assembled and installed with minimal hand tool requirements. It goes without saying that the retractable skeleton and the hoverseat or even sport seat that comes with the kit must also be easy to disassemble. Seats – There are a variety of seats that you can choose from. You can get a sport seat for a really fabulous look or you can choose a specially designed hiverseat. The seat should be durable and sturdy and be able to accommodate both your size and your weight. Your seat should give you optimum comfort while riding the hoverboard turned mini kart. Foot rests – Riding a hoverboard typically means your feet will be firmly planted on the deck. But since it’s the accessory or attachment that will be firmly connected to the deck, your feet must have a structure to rest on. Controls – The controls on a hoverboard Go-kart accessory kit are inherently tied to the sensor mechanisms on the hoverboard. On the most basic design this is accomplished by moving the handle bars located on both sides of the mini kart attachment. To go forward, you have to push the handle bars downwards in pretty much the same manner as you would shift your weight forward to accelerate. To reverse, just do the opposite, pulling on the handle bars upwards or backwards. Turning requires the combination of an upward and downward movement of the handle bars, depending on which side you want to turn into. Compatibility – Some mini kart accessory kits are designed specifically for certain brands and models of hoverboards. So, before you choose the best hoverboard cart for sale, you really have to check the brand and model of your self-balancing scooter whether this is compatible with your chosen go-kart attachment or not. Customer reviews – Your best sources of information about the best hoverboard cart for sale are consumers themselves especially those that have taken the time to write a lot of positive things about a certain product. Price – Depending on the materials used and the overall design integrity of the go-kart kit, you can shell out anywhere between $35 and $120. For individuals who may have concerns about stability when riding a standard hoverboard, attaching a conversion kit is the best solution to enjoy the many thrills of these gadgets. With the best hoverboard cart for sale, you can now move effortlessly in your own modified mini kart and in style.